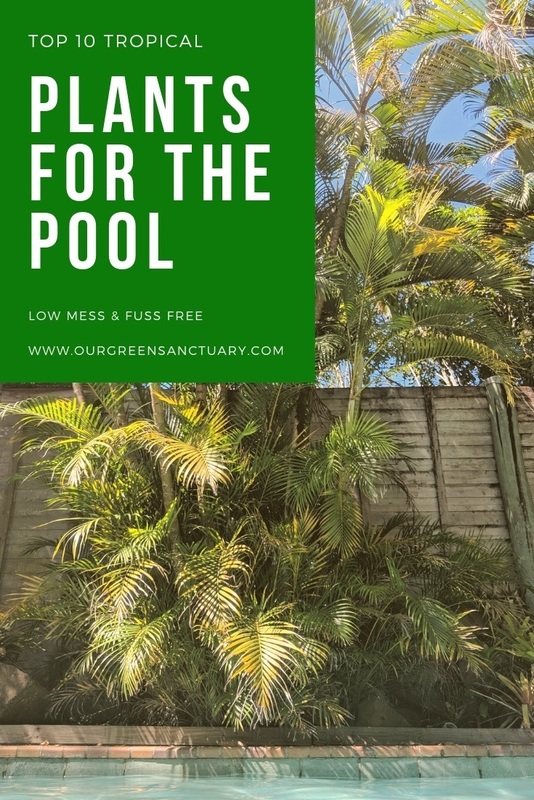 Understanding which tropical plants to choose for your pool area means understanding the environment. The pool creates a warmer microclimate but in Sydney you still need cold-tolerant plants. Around a pool area, plants should be tidy, low maintenance and people-friendly. 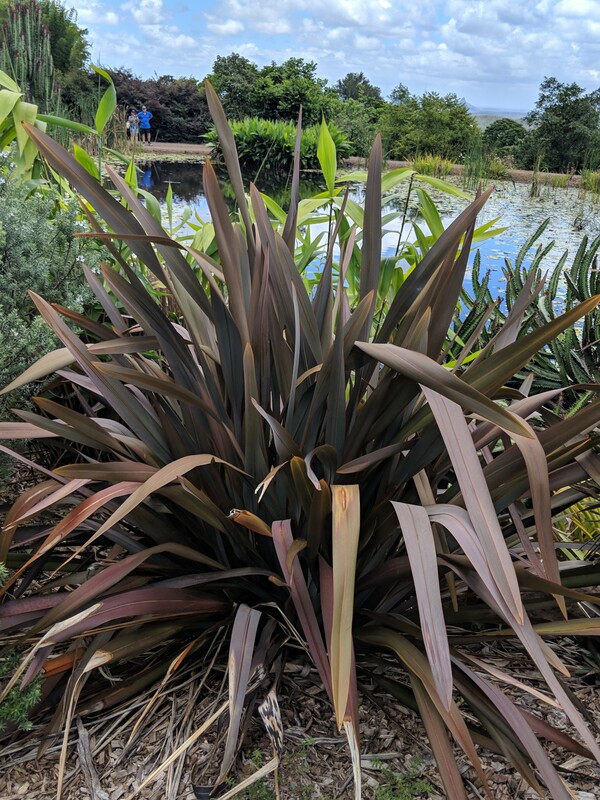 Featuring striking colours from light green to russet bronze and sometimes striped, Phormium have long broad strappy leaves, these tropical grassy plants are low maintenance and drought tolerant once established. Remove older leaves as required and cut back halfway every 4 years. Suitable for full sun positions Phormium can be used as a feature plant with varieties growing up to 1m, and is very well suited to our Sydney climate. Cordyline is a genus of about 15 species of woody stemmed grassy plants. 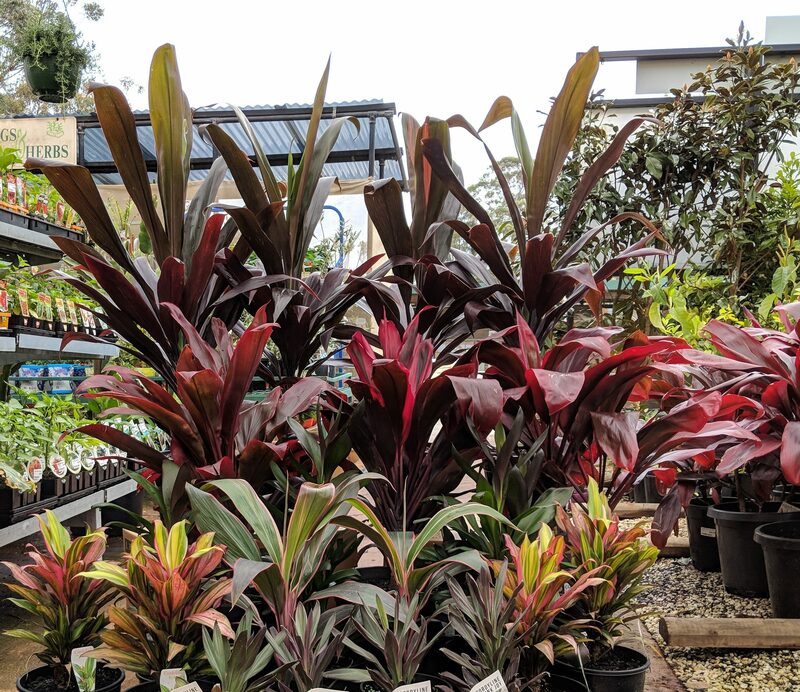 Available in striking colours & patterns, these strappy leafed plants have sun tolerant and shade loving varieties suitable for most tropical gardens. Shade varieties such as cordyline rubra compliments palms beautifully with contrasting colours adding interest to a tropical landscape. Sun tolerant cordyline varieties such as “Electric Flash” and “electric pink” add bright pops of colour. Cordylines can develop woody stems, if these aren't to your taste, simply chop the tops off and replant. Cordylines are otherwise relatively low maintenance & can be drought tolerant once established. The lush dense foliage of False Cardamom the evergreen ginger, is fantastic for filling mid-ground spaces in tropical or subtropical gardens. Another great feature of the plant is the spicy fragrance of the foliage. A simple plant to care for, all it will need is a tidy up twice a year. Cut older stems back to the ground, remove dead leaves and flowers. Arching clumps of shiny, slim, strappy foliage, featuring tight tall lavender flower stems from the centre of the plant. The dark green grass is offers simple elegance and will compliment the tropical garden foliage. Perfect for borders or in clumps, Liriope loves the shade but tolerates some sun. A simple plant to care for, remove dead flowers and cut back damaged foliage, trim to ground level yearly to maintain growth. A very tolerant plant in many climates and conditions through drought tolerance, wet feet and frost. Soil: Moist, well drained soil with reasonable fertility. Broad strappy deep green leaves spray outwards forming clumps of green foliage. Trumpets of orange, cream or red flowers sit atop green stalks appearing in late winter and early spring. Low water in winter and generally low maintenance, keep mulched and well watered in the warm months. Suitable for mild conditions, protect from frost and extreme cold, planting in shaded conditions under trees. Use in borders or clumps, and best mass planted. The Brazilian Plume Flower features Pink or white flowers from early summer to late autumn, and may spot-flower in winter. A soft wooded shrub to 1.5m with large lush leaves and a rewarding plant, simple to care for requiring a light trim after flowering. A tough plant but may be pruned back hard - even to ground level if required. It will flourish in sun and still flowers in shade, tolerant of Sydney's hot summers and cold winters. Nothing says tropical quite like Bird of paradise. There are a few varieties of bird of paradise including my personal favourite Strelitzia nicolai, along with Strelitzia reginae and Strelitzia juncea. Featuring unique long lasting bird shaped blooms and large grey to green leaves, these low maintenance plants can be planted in containers or in large garden beds. Use as a feature plant or to create a feature part of your garden by double or triple planting with Strelitzia nicolai. Large fanned glossy, green palmate leaves, deeply divided into broad, ribbed segments, like fingers. Clumping bamboo like stems, wrapped in a protective fibrous sheath where new foliage emerges. They are relatively cold tolerant and can be grown outdoors in subtropical or warm temperate climates. Also suitable for indoors and listed by NASA as one of the top air purifying plants. This palm is great to use as a specimen plant or to create a lush screen. The Rhapis palm is a low maintenance plant with only the occasional brown leaf to remove. A Native to Australian the Bangalow Palm is found along the east coast of Australia in QLD and NSW. A single stem palm is sometimes sold in multiple plants per pot with bright green leaves on paler stems. Growing to a mature height of 30m and trunk width 30cm in diameter bangalow is cold tolerant but not frost tolerant. Requiring little maintenance but a good water supply during the growing season.Fertilise with a palm-specific fertiliser. 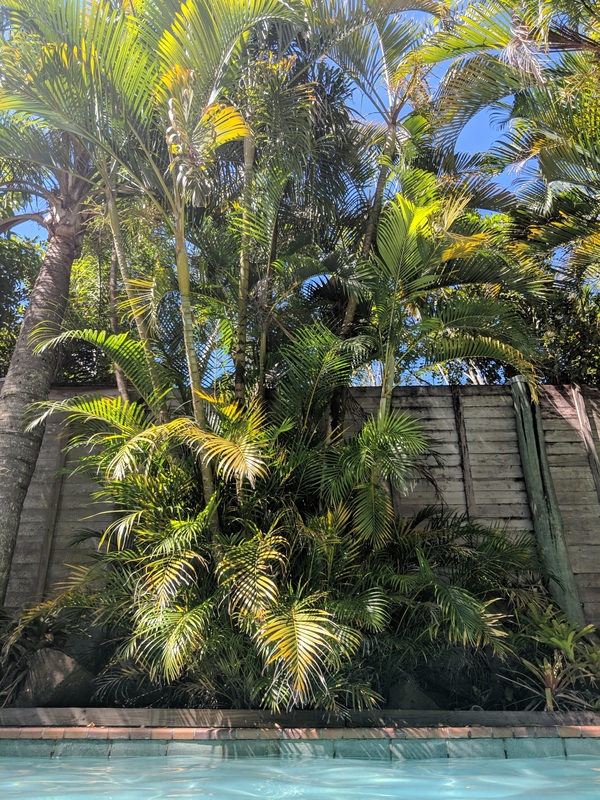 Bangalow Palm can also be grown as a pot plant or planted in the ground to reach maturity. Soil: Moist, Well draining and fertile soil. Sun tolerant and clumping the golden cane palm is named for its yellow stems and sometimes golden foliage which arches in long pinnate fronds, appearing much greener in the shade. A good screening plant, the golden cane palm creates shade with dense foliage providing that lush look and tropical vibe to any pool area. Can be planted in containers but will do best when grouped with other plants as golden cane doesn't love the cold. Feed in the warmer months and maintain by removing dead fronds. 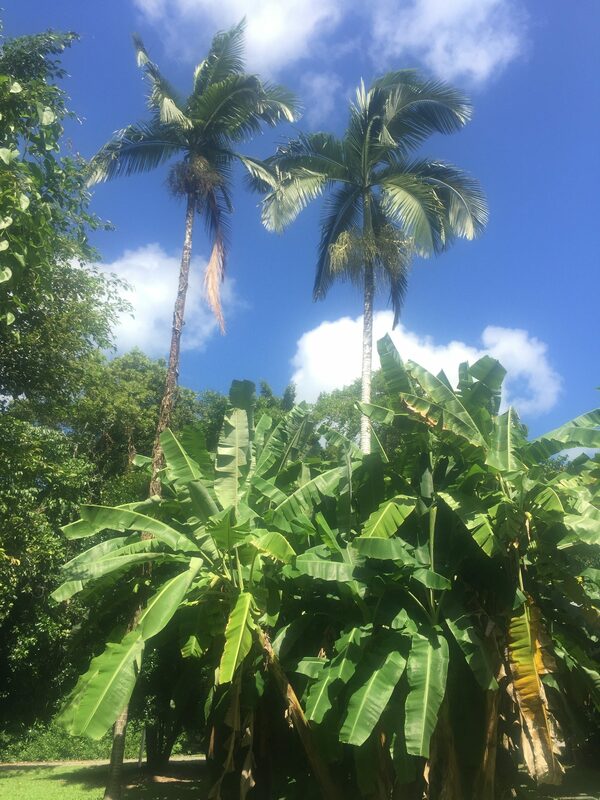 The best way to maintain a tropical garden with these plants is simply feed and water regularly during the warmer months but keep much drier over winter to prevent root rot and other fungal diseases. Clean up dead or damaged foliage and flowers. The majority of this work can be done once a month. What are your favourite plants for around the pool? Drop them in the comments below! Can plant care teach us self-care? How do you know if your plant needs a new pot?